With all the biggest hits of the year just around the corner, it goes to say that the free games from the PlayStation Plus Instant Game Collection in September might not be the most exciting bunch of all time. After all, Sony wants you to drop big bucks on the big games, and you won't do that if you're playing small free ones. Velocity 2X is the biggest game of the pack, which is really saying something about the size of the games here. I dabbled in the first game, which was made free for the PS Vita back in April, and thought it was a pretty solid SHMUP with its Quarp Drive teleportation mechanic. This sequel has both the classic space shooting stages as well as some good old fashion run 'n gunnin'. Our blonde female lead looks a little too close to Zero Suit Samus, but I'll let it pass because it looks like a blast. Maybe it's time I plug my PlayStation 4 in, eh? Velocity 2X both launches and become free on the PlayStation 4 and PS Vita next week. Play it for free from first availability and spread the word afterwards so your friends have to pay. The other game I'm most interested in checking out also sees its launch next Tuesday on the PS Vita. 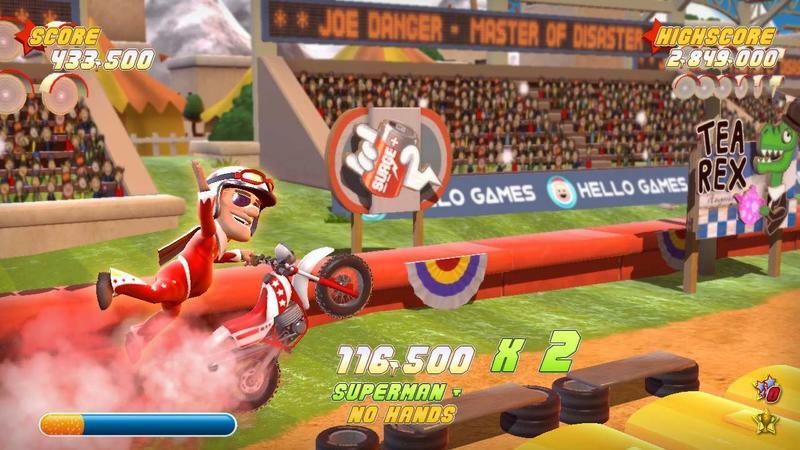 Joe Danger is not my usual kind of game, but the indie team behind it, Hello Games, is also hard at work on No Man's Sky. Neither game has anything in common, but jumping from a simple biking platformer to a massive science fiction game that takes 585 billion years to see everything is quite a leap. Closing out the month are a handful of other indie games. A local multiplayer game called Sportsfriends on the PlayStation 3 and 4, a strategy game called Hoard on the PlayStation 3, and a "seminal 90s tube shooter" called TxK for the PS Vita. All look decent enough to check out for free. And then there is Sony's infamous Super Smash Bros. clone PlayStation All Stars Battle Royale, the fighting game which pits all of the classic PlayStation characters together in a fist fight to the death. I'm not sure if this game becoming free a month before the new Super Smash Bros. is released is a coincidence or not, but needless to say, it's not half as popular Nintendo's seminal nostalgia-thon. So September is not the best month around for me, but I'll survive knowing I have Destiny, Azure Striker Gunvolt, and the month of October to look forward to. What do you think of the lineup?